There are many types and grades of plastics that can be successfully coated with UV-cured powder coatings. UV-cured powder coating is an electrostatically applied coating material. In the finishing process the part is briefly heated and is electrostatically charged. Most plastics will deform when heated and are not conductive therefore most plastics are finished with a liquid paint and air-dried. UV-cured powder coating requires only enough heat and time to melt the powder, 130°C at 1-2 minutes, and then cured instantly with UV light energy. A primer is used to make the surface of the part conductive. Because of the low temperatures, fast melt time, and the use of conductive primer; many types of plastics can be finished with UV-cured powder coating. Plasma is used to modify and prepare the surface of a plastic part prior to the application of the UV-cured powder coating. Plastics by their nature are difficult to finish. The surface may have contaminants that are unseen to the naked eye and have low surface energy that impedes wetting and flow of a coating. Each of these conditions will compromise coating adhesion. Without satisfactory adhesion the coating will fail and not meet the product’s performance requirements. 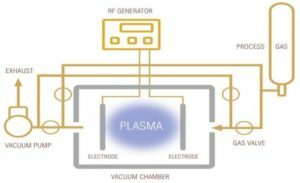 Plasma is a gas that carries an electric charge. When introduced to the surface of the substrate the contaminants are removed and the surface energy is increased, making the part ready for powder application. Parts are placed inside the plasma chamber and air is evacuated producing a vacuum. The selected gas is injected into the unit and electromagnetic (RF) energy is supplied across the electrodes producing the plasma that treats the entire surface of the part. There are various conditions and processing variables that can be manipulated; including processing time, RF power, and vacuum pressure. A successful treatment can be designed for the substrate by modifying these parameters. Many different types of plastics that be successfully coated with UV-curable powder coatings. Please contact us to determine if your plastic can be coated. Our chemists will work with you to formulate a coating for your plastic material. Fill out our Project Request Form if you have a project you feel UV powder could be a fit for.